“I’ve been coming to Montauk ever since I moved to New York from Brazil to attend university,” says Jayma Cardoso, the hotelier and nightlife impresario behind The Surf Lodge, a storied Montauk mainstay that has become near synonymous with the beachside hamlet located on the easternmost tip of Long Island. Cardoso has been returning to Montauk, an erstwhile mellow summer haunt once considered a cheaper alternative to the Hamptons, for going on almost two decades now. The Brazilian-born bar baroness partnered with two others on the opening of The Surf Lodge in 2008 after having been involved in a handful of other high-profile New York venues, including the extravagant SoHo GoldBar, TriBeCa’s Cain and Lavo in Midtown. Over the last nine sold-out seasons, The Surf Lodge has grown into a cultural institution with international appeal as strong as any other Manhattan watering hole, and Cardoso – now the sole remainder of the original partners – has become the community’s most visible advocate. Commensurate with The Surf Lodge’s growing appeal, Montauk proper has enjoyed a commercial and residential real estate boom that has seen the once sleepy outpost become a high-end vacation destination for Manhattanites undeterred by peak season prices. The 20-room boutique hotel, first built in 1967 and flanked by a wraparound deck, also includes a popular restaurant, shop and art gallery overlooking serene Fort Pond. Its enduring popularity with the rosé crowd, and its well-publicised issues around noise complaints, situate the hotel at the nexus of the area’s seemingly unrelenting gentrification. 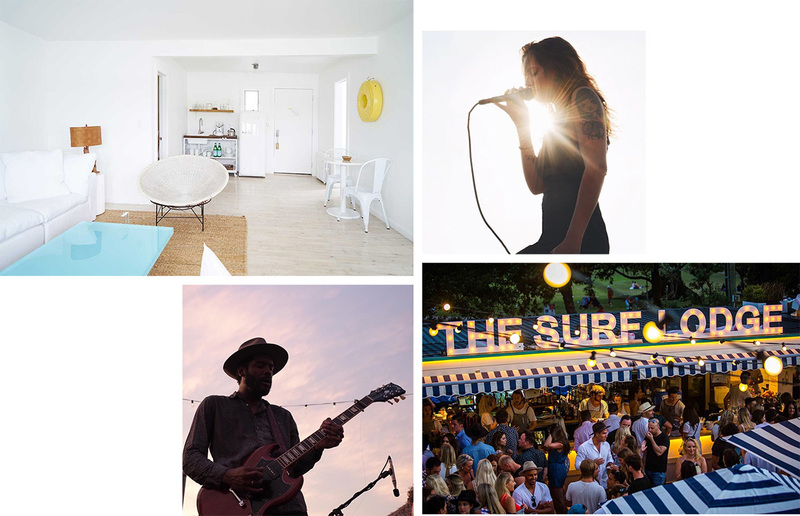 Much the chagrin of nearby residents, the Town of East Hampton council and the State Liquor Authority, the hotel plays host to a rotating series of live music, high end pop-up stores and wellness events across the summer. Live acts from this season past included Chairlift, Miike Snow, Talib Kweli and Gary Clark Jr. 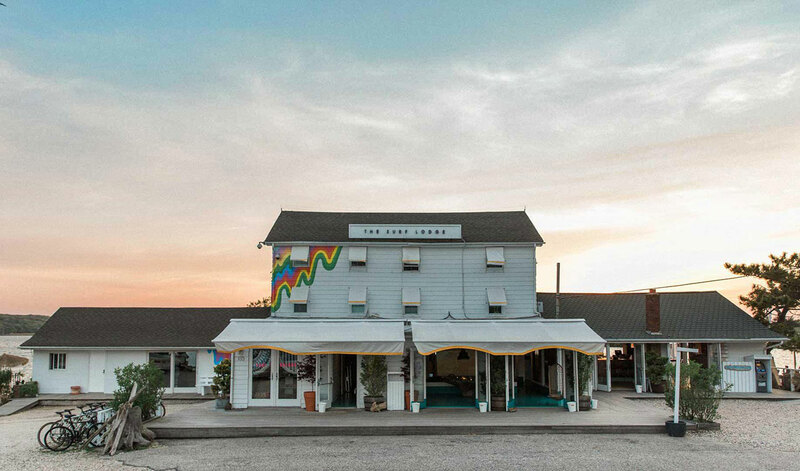 The drawcard experiences of Cardoso’s booming lifestyle brand have proven an undeniable hit with visitors to Montauk and around the world, and plans are afoot to expand The Surf Lodge brand to Miami, Malibu and Vermont. Closer to home, The Surf Lodge will next year hold its second New Year’s Day pop-up at the Watsons Bay Boutique Hotel in Sydney. After last year’s sell-out event, the tropical themed party returns with a lineup as eclectic as the Montauk venue itself. Halfway Crooks, Surf Lodge music curator Oli Benz, Beni and Bang Gang DJs will feature prominently across three levels. While officials in Sydney and Montauk remain adamant about enforcing noise reduction codes against live music in an effort to temper the growth of culture in both cities, Cardoso and her coterie of collaborators would appear to be largely unconcerned. And though the irony of not being able to escape noise complaints on the other side of the Atlantic is too delicious to ignore, there’s an even more convincing symmetry that exists between Cardoso’s hotel and the Watsons Bay institution. Theirs is a natural partnership with many traceable parallels, least of all live music, high spirits and sunsets beyond compare. What could possibly be more Sydney (by way of Montauk) than that? TICKETS FOR THE SURF LODGE NEW YEAR’S DAY PARTY AT THE WATSONS BAY BOUTIQUE HOTEL ARE AVAILABLE NOW. Jayma’s recommendations for the best places to stay, play, wine and dine in Montauk can be found here.